I have an old film camera that belonged to my dad. It's a Yashica that was purchased some time in the late 1980s. I've dabbled in film over the years, but ultimately always gone back to my SLR. I finally got a roll of film developed and couldn't remember what was on it. It turned out that the photos were from 2013 and 2014. 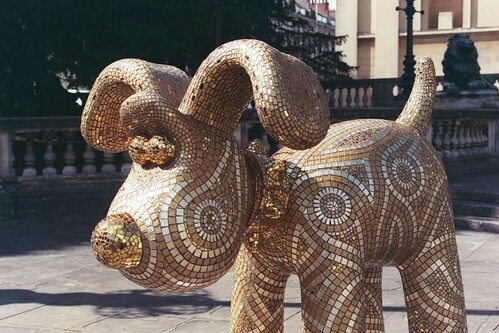 Quite a lot of them were of the Gromit sculptures that were in Bristol in 2013. I particularly liked this one because it was shiny and I'm secretly a magpie! Look at the full set of film photos on Flickr. More recently we had sculptures of Shaun the Sheep around the city. The sculptures weren't just for fun though; they were auctioned off for the Wallace & Gromit's Children's Charity that raises money for sick children in the UK. Back to film: at the moment I've got a roll of black and white film in my camera, but I prefer using black and white in the winter when there are fewer pretty colours around. I might try taking some photos of the balloon fiesta with the film camera this year, as I now have piles of them in colour from my SLR. The perks of living high up with a great view of the skyline!